Today we are excited to have Cheryl Neiswender share. She comes with an honest heart writing about a time when she stepped outside of God’s plan and found herself in need of grace. We trust you will be blessed and encouraged. It sounded like the perfect job for me. A new Christian school in the area where we were relocating had exploding enrollment for the next year and needed an elementary principal. Wasn’t the Scripture verse the same as my former school of fifteen years? Didn’t the heart of the administration mimic my own heart for Christian education? It felt so right. Taking the position without asking for my husband’s opinion, I immersed myself into the maze of trying to hire teachers, admit students, prepare classrooms, and order books that summer in a school where the number of students had more than quadrupled for its second year of existence. Fast forward a couple of months, and my mornings started at 5:00 a.m. with reading the newspaper to see what I would face later at school. Unrest in the church leadership made the front page headlines on a daily basis. Though I was determined to make sure God’s work was done despite the chaos, my husband intervened and asked me to resign after only three months on the job. Incredibly, I didn’t even know who to notify that I was leaving. My boss had already been fired and things were in such disarray. I emailed my letter to the only one I thought was my authority, phoned the elementary teachers, and packed up my office in defeat. Eventually, I was able to see that what had seemed like God’s plan was merely a cloud of smoke hiding my delusion that I could be the heroine who would save the day. Pride made me susceptible to deception. Instead of producing humility, this revelation humiliated me. Would God ever want to use me again? Am I the only one who tends to hide behind a bush of shame instead of fall before the throne of grace in my time of need? If we are saved by grace, why do we forget we are also sustained by grace? 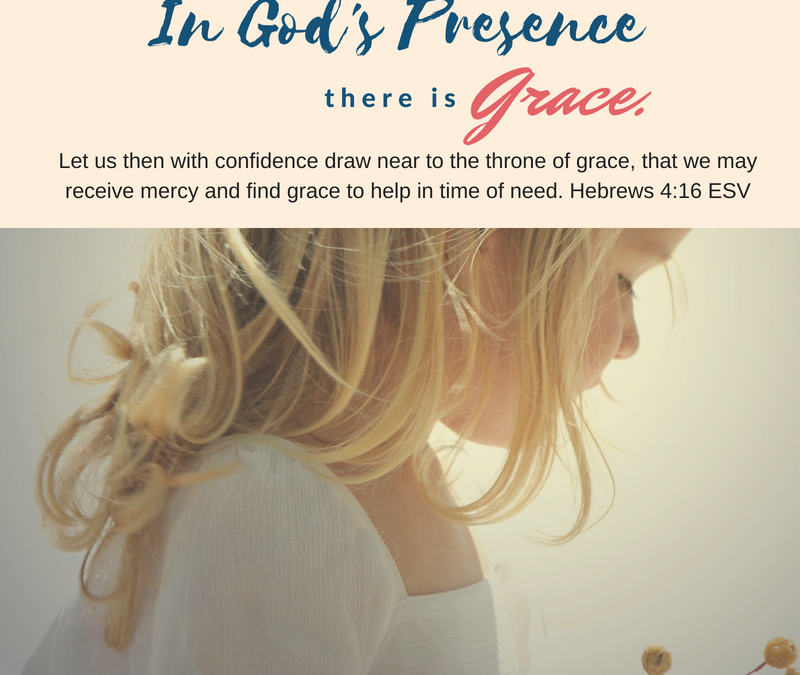 Desperately needing to be restored, I had to push past my feelings of failure and confidently approach the throne of grace…to receive mercy…to find grace. Hebrews 4:16 instructs us where to go to find grace. 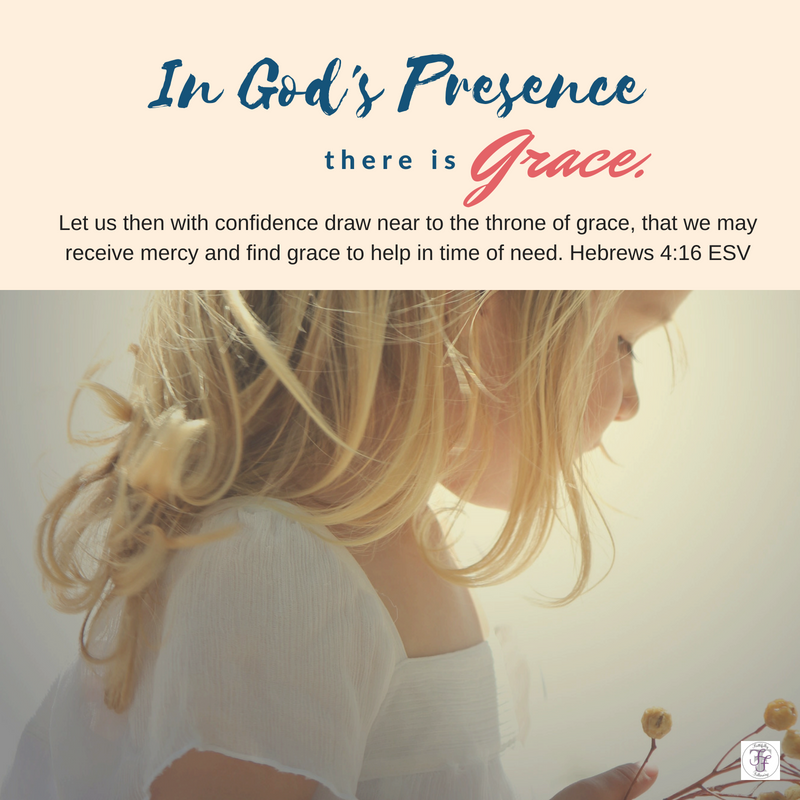 In God’s presence, I did not feel His disappointment with me as I feared. I felt His grace. What does the psalmist proclaim about those who look to the Lord in verse 5? Verse six tells us that when we call, the Lord will hear and ___________________________________. Verse eight ensures us the Lord is good and we are blessed when we __________ _________ in Him. Does knowing this truth help you to confidently approach the throne of Grace? Are you currently in a situation where you need God’s help? Be encouraged. Avoid hiding in shame. God does not want us to live a life afraid of His response. He is awaiting you with open arms. His response is assured. It will be filled with grace. We are so thankful for your participation! We have prayerfully decided to pause our study and offer part 2 of In God’s Presence in October. Our team lives up and down the NC coast and we are bracing for Hurricane Florence and anticipating disruptions in power and internet. To ensure we offer the best study possible we are pausing. We trust God is still present, in control, and that our part two will come at just the right time in our lives and yours! During part two we will discover in God’s presence there is healing, confidence, love, rest, and hope! We look forward to continuing this journey together in October. Our prayers are with everyone affected by the storm. Oh, that ‘bush of shame”…..been there, done that! And not just once! Cheryl, thank you for reminding me that sitting in the shadow of shame is not where God wants me to be, but rather basking in His Grace! And ladies on the coast, my prayers are with you! Keeping each of you in my prayers during this difficult time of storms and floods. May God surround each of you with his protection. Thank you! Our families haave property damage but they are all safe. We are reaching out where we can to help. Thank you again for your prayers. I have subscribed to the blog, but I am still not receiving any of the blog posts. I have subscribed you from my side. Let me know if this helps. We do not have a daily email. If you are interested in seeing more frequent posts from us we typically post each weekday on our facebook page. Our blog is most active during our mini-studies which occur 4-5 times during the year.